This Ticket of Leave returns to the format we’ve used for many previous releases — namely a short sourcebook section, exploring an aspect of life in the colonies, followed by a lengthy scenario seed. Ticket of Leave #11: The Dispensatory of Doctor Macdead, delves deeply into the seedy and somewhat primitive world of medical practice. By modern standards, the medicine of the late 18th Century seems crude and horrific. But the surgeons and doctors of early Australian colonies practiced their art with even more primitive tools. Perpetually under-provisioned, and utterly reliant on a supply of European medicines which frequently did not materialize, the official colonial doctors struggled somehow to treat the thousands of officials, settlers, and even convicts. To make matters even worse, however, the colony had no real concept of regulating the medical profession — this meant that several of the official surgeons sent out from England were woefully under-qualified. Also there were a raft of private doctors who set up shop in the larger settlements … sometimes without any qualifications at all. These charlatans and hoaxers weren’t necessarily malicious, just greedy con-artists whose fake treatments were trusted by honest folk. 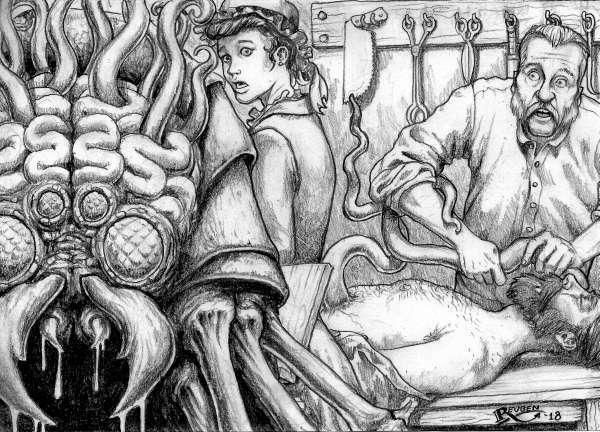 The scenario found in Ticket of Leave #11 concerns a most unusual medical book (the titular dispensatory) which causes some considerable Mythos-related mayhem in the the hands of an amateur medical man. The charlatan doctor — James Macdead — has engaged in some most unusual surgical treatments at Parramatta, but has since disappeared. Rumours of strange side-effects of his treatment has come to the attention of the colonial authorities, and naturally the messy task of looking into those weird tales falls to … yep, you guessed it, the investigators! 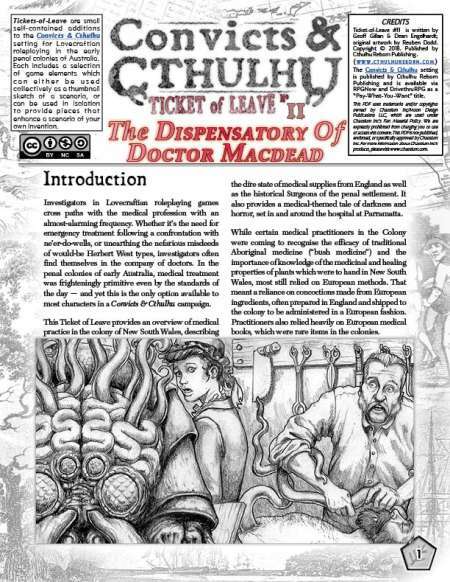 Ticket of Leave #11: The Dispensatory of Doctor Macdead is available right now for free download from the Cthulhu Reborn blog, complete with game statistics for Call of Cthulhu 7th Edition (under Chaosium’s fan license). For messy reasons relating to Intellectual Property restrictions imposed by Chaosium, we are obliged to also create a stat-free version for distribution via DrivethruRPG — most likely, you’ll want the version with the game stats. But if not, jump on to Drivethru and you’ll find the other one. We really hope that you and you game crew decide to give the scenario a spin — either as a standalone taste of dark colonial horror, or as part of an ongoing Convicts & Cthulhu campaign. It would work equally well in either context. Oh, and one last thing … I am certain that some folks will assume that the name “James Macdead” is some kind of Pulpy creation of ours — in fact it isn’t: there was actually a real convict bearing that amazing name transported to Australia (although he wasn’t a doctor and arrived a little later than the C&C era, so we have taken some liberties). This entry was posted on Wednesday, May 23rd, 2018 at 3:57 am	and posted in Convicts & Cthulhu, Scenario Downloads. You can follow any responses to this entry through the RSS 2.0 feed.